Add some Asian flavour to your weekday menu with this quick and easy recipe. 1. Preheat the grill to 240ºC. 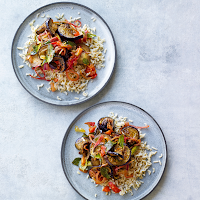 Trim and cut the aubergines into 0.5cm-thick slices, halving any larger pieces, then arrange on a large foil-lined baking tray (don’t worry if they overlap; they will shrink as they cook). Grill for 5 minutes, then turn over and grill for another 5 minutes. 2. Heat the vegetable oil in a large frying pan or wok over a medium-high heat. Add the spices and salt, then cook for 1 minute. Add the onion, garlic, tomatoes and curry leaves, then cook, stirring, for another 2-3 minutes. 3. Tip the aubergine into the pan, toss everything together for 2 minutes, then add the mustard, vinegar and sugar. Fry for another 2 minutes until combined. Serve the aubergine with the rice cooked according to pack instructions, plus natural yogurt and chopped coriander, if liked. Grilling the aubergine slices before frying them means you don’t need to use more oil in the pan.